Blue Light Demystifier - Torga Optical - Fashion Eyewear, Spectacle Spectacle Deals and German Precision Lens Technology. Solutions for your visual day! There’s been much talk about blue light, what it is and what effect it may or may not have on your eyes. In search of the facts to demystify it, we have compiled a quick and easy Blue Light Fact Checker. These facts have been checked and rechecked by a number of health- and eye-care and practitioners, as well as optical experts. Firstly, what exactly is Blue Light? Sunlight is made up of a combination of red, orange, yellow, green and blue light rays, also known as "white light". Different coloured light rays have different wavelengths. The wavelength of the light will determine the amount of energy that it contains. - Warmer light rays (reds, oranges, and yellows) have long wavelengths and contain less energy. - Cooler light rays (blues and ultraviolet) have shorter wavelengths and more energy. - The more energy a light wave contains (i.e. blues and violet), the more damaging it can be when exposed to it for long periods of time. Blue light is what is referred to as high-energy visible light (HEV light). Blue light is everywhere. Sunlight is the main source, but, fluorescent and LED lightingand almost all digital devices (flat-screen televisions and the display screens of computers, smartphones, electronic notebooks) emit blue light via their screens. The result of excessive use of such devices is eyestrain (known as digital-eyestrain), premature ageing of the eye and disturbed sleep patterns. As you are reading this article, you are being exposed to blue light! Although sunlight is the primary and largest source of blue light, it’s the closeness to which we hold our digital devices to our faces combined with the frequency of use that makes their emission of blue light harmful. So, too much exposure to blue light is potentially disturbing at best and damaging at worst. However, small amounts of blue light can be beneficial. It can boost alertness, aid memory and cognitive function and can even improve one’s mood. But too much blue light (especially at night: working on your laptop or reading a novel on a tablet, for example) can be disruptive, potentially causing sleepless nights, daytime fatigue, eyestrain and eye damage. However, almost all blue light passes through the cornea and lens and reaches the retina. The result of which is, as already mentioned above, can possibly result in multiple problems. In certain wavelengths, blue light has been implicated in the development of age-related macular degeneration (AMD) (which results in vision loss), tired-eye syndrome, as well as disturbed sleep patterns. Well, this remains to be seen. We are still to realise the full effects that the digital age may have on us in later life. But many eyecare practitioners are concerned about the potential damage that may be caused by digital devices, in the years to come. How does Blue Light cause eye strain? Short-wavelength, high-energy blue light scatters more easily than other light, which means that one cannot easily focus upon it. If you're looking at a computer screen, smart phone or other digital device that emits blue light, this unfocused visual light reduces contrast. This can result in the user straining his/her eyes. In order to increase the contrast, which can in turn reduce the strain, complementary warmer filters (or tints) can be used. 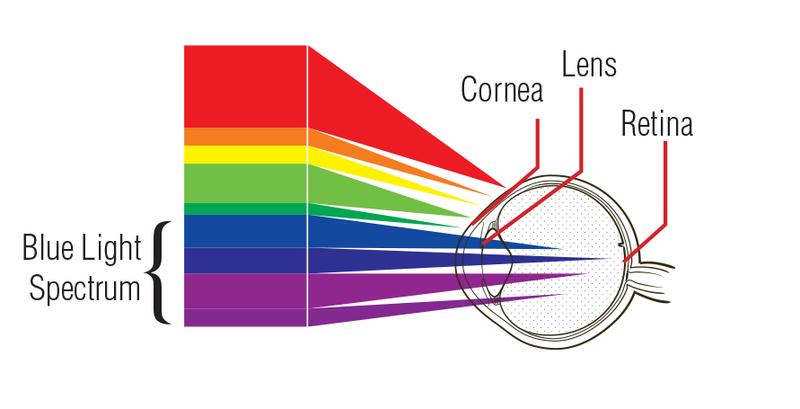 This is why the lenses that eyecare practitioners use to will block blue light are usually orange or yellow-tinted. These tinted lenses will reduce eye strain, improving the visual comfort for digital device users. Increasingly, more optometrists and other eyecare practitioners are advocating blue-blocker lenses – especially to patients who spend long hours staring at a computer screen or other digital screens. Torga Optical has the lens technology to provide the ideal solutions when it comes to blocking blue light. Click here to read more about how your digital lifestyle can affect your vision and which Torga products are available to alleviate the symptoms. Make a booking online at your nearest Torga Optical practice. The above article was compiled with professional consultation from Claire Wiggill (BOptom (RAU)) and Andre Brits (FOA(Disp)SA).